Since a majority of pharmaceutical solid-state materials are organic crystals, their handling and processing are critical aspects of drug development. Pharmaceutical Crystals: Science and Engineering offers an introduction to and thorough coverage of organic crystals, and explores the essential role they play in drug development and manufacturing. 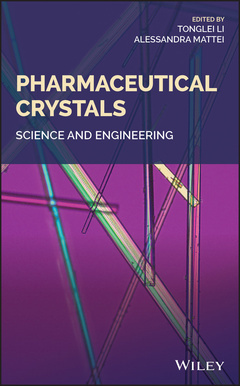 Written contributions from leading researchers and practitioners in the field, this vital resource provides the fundamental knowledge and explains the connection between pharmaceutically relevant properties and the structure of a crystal. Written for both practicing pharmaceutical scientists, engineers, and senior undergraduate and graduate students studying pharmaceutical solid-state materials, Pharmaceutical Crystals: Science and Engineering is a reference and textbook for understanding, producing, analyzing, and designing organic crystals which is an imperative skill to master for anyone working in the field.